LEFKOSA – Turkish Republic of Northern Cyprus has progressed in the world despite it being forced into isolation, Turkish deputy prime minister said Thursday. Turkey’s Deputy Prime Minister responsible for Turkish Republic of Northern Cyprus, Bulent Arinc, said the region’s politics, economy and social welfare could be a candidate for “a success story” under its trying circumstances. Arinc made the remarks Thursday during his two-day visit to Lefkosa, where he attended the groundbreaking ceremony to extend the Ercan International Airport. He said that about 80 planes arrived and departed from the region, with a total annual capacity of three million. The new project now aimed to enhance the airport’s capacity to 10 million passengers. Turkish Republic of Northern Cyprus President Dervis Eroglu said that the airport would be ready within four years. Arinc said he believed that the region would prosper further in the future with the help of “Peace Water,” which is an under-construction 80 kilometers' (49.7 miles) long water pipeline from Turkey to the Turkish Republic of Northern Cyprus. The pipeline is dubbed Baris Su, meaning “Peace Water,” which would eventually supply the eastern Mediterranean island of Cyprus with fresh water. 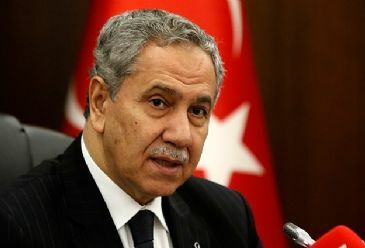 Arinc said that Turkish Republic of Northern Cyprus had shown determination in negotiations aimed at reaching a lasting and sustainable peace with the Greek Cypriot administration and unification of the divided island. Negotiations between the Turkish and Greek Cypriots resumed after a two-year pause in February 2013. The previous round of talks had collapsed amid of the Eurozone debt crisis as the Greek Cypriot side took its turn to occupy the EU presidency in 2012. However, the Greek Cypriot administration suspended the talks over the divided island on Oct. 7, 2014 after Turkey sent a ship to monitor an oil-and-gas exploration mission off the coast of Cyprus. Cyprus has remained divided into Greek and Turkish parts since a Greek Cypriot coup was followed by a Turkish peace mission to aid Turkish Cypriots in the north in 1974. Turkish and Greek Cypriot leaders have been engaged in a peace process since February to reunify the island.